There is nothing like a film which divides people's opinions by miles. Whether you take to Joon-ho Bong's first English language film, Snowpiercer or not doesn't make any difference to the fact that it is a film which inspires ongoing thought and conversation. It is an understatement to say that this film is not a film for everyone due to it's intense violence and exceptionally dark humour, but underneath that harsh exterior is a film with an original and suspenseful screenplay and incredible production design. Snowpiercer is absolutely memorable for whatever reason you allow it to be, but your negative memories may be hiding the gem it is underneath. Set in the future when the whole world has been frozen over and much of human life destroyed with it, what is left of the human race is aboard a continuously running high-speed train named the Snowpiercer. The train is divided into classes with the upper class at the front of the train living in luxury with all they will need and the lower classes living at the back of the train living in worse poverty than they would be living in on the outside. After two of their young children are taken, the people at the back of the train led by Curtis (Chris Evans) decide to rebel and make their way to the front of the train to confront the train's inventor and conductor, Wilford (Ed Harris). Curtis and his group embark on a journey towards the front of the train which proves to be absolutely horrific. It cannot be stressed enough that Snowpiercer is not a film that everyone will enjoy. Snowpiercer is by no means your run of the mill action/drama film and is shocking on so many levels. The faint hearted will find the film most shocking for it's extreme violence, which is particularly brutal and graphic with the axe among the weapons of choice and amputation a chosen form of torture. The screenplay and story itself are also rather shocking for a number of reasons. With the film's Australian premiere at the Sydney Film Festival in June, festival director Nashen Moodley likened Snowpiercer to the television show, "Game of Thrones" for the reason that nobody is ever safe. It is established early on that no character is ensured safety against harm in the film. While this is a trait we have come to associate with productions such as "Game of Thrones", it is still a relatively shocking concept as traditionally lead characters in a film or television show are immune to an early death or death at all. It is very much a case of survival of the fittest and a study of the class system, which is present in society as much in the present as in the future in the film. The weak in the lower class do not have the strength to survive in the harsh conditions they are made to endure, while the weak can survive in the higher classes as they are given the resources to be able to do so. Although post-apocalyptic films are not particularly rare in this day and age, Snowpiercer has a great deal of originality to it based on it's dark screenplay and black sense of humour. The film is incredibly suspenseful and unpredictable due to it's early reminder of the characters mortality. The oppression felt by the main characters from the back of the train resonates and the audience experiences this on an emotional level with the characters. It is not a happy film, rather an angry one laced with rebellious hope. The film does have a sense of humour which is extremely black and could be misinterpreted by some as it trying to be serious and failing miserably. When sifting through the moments in the film which are being laughed at, it seems more than likely that director Joon-ho Bong and co-writer, Kelly Masterton are purposely using over-exaggeration in order to give the film more character and that this is turn allows for a few evil giggles. However, at the end of the day, whether people find Tilda Swinton's Mason, Alison Pill's Teacher or Chris Evan's now infamous baby quote funny is completely up to the individual. The production design of Snowpiercer is superb. The way the train was created with each carriage having a different personality is completely intriguing. With each different carriage having to be a completely different world inside the same shaped space, the designers do so well to be able to complete this. The visions of the frozen world outside the Snowpiercer are also very well done. The cinematography employed in also intriguing, in particular in the tunnel scene. Although this is also perhaps the most violent scene in the film, the way in which shadow and light are used to observe the happenings is very interesting. Chris Evans' Crurtis leads the charge in Snowpiercer. Evans is once again able to use his action film experience and do so in style during the film, but he also gives a very raw, human performance. It perhaps isn't a performance which oozes emotion, but he shows it where it is needed. Jamie Bell, who plays Curtis' offsider, Edgar also does well as does Octavia Spencer as Tanya. The most memorable performance is Tilda Swinton as Mason. There is so much character and intrigue when it comes to Mason. We never really find out that much about her, but she is such a great and intriguing character to watch. The way in which Swinton commits everything she has in performance and body is brilliant. Alison Pill's Teacher is another memorable character. She has very little screen time and no background story, but again, brilliant to watch and a load of fun in a dark and quirky way. 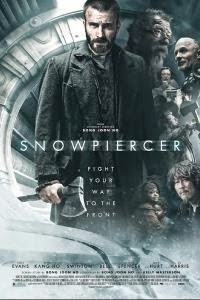 Snowpiercer is a welcomed film due to it's wicked originality and unpredictability. The reasons many will dislike it will be the reasons many will love it. It is exceptionally dark in mood and humour and rebellious towards traditional rules of the action and drama genres.